HP ENVY 15-3040nr is equipped with a 15.6-inch Full HD Radiance Infinity LED-backlit display and Radeon HD switchable graphics. This laptop has 1024 MB DDR5 dedicated graphics memory and up to 5093 MB total graphics memory. The HDD capacity is 750 GB (7200 rpm). 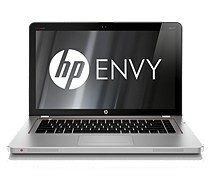 HP ENVY 15-3040nr packs 8 GB DDR3 1600 MHz system memory. This HP notebook comes with aluminum finish in nero black and natural silver. Other features include Intel Core i7-2670QM quad-core processor, 8-cell 72WHr lithium-ion battery, HP TrueVision HD Webcam, card reader, two SuperSpeed USB 3.0 ports, one USB 2.0 port, HDMI port, DisplayPort, two headphone-out, RJ-45 (LAN), microphone-in, Beats audio, 6 speakers, a subwoofer, and HP Wireless Audio.